Want to enjoy climbing and hiking and the beautiful outdoors in Red River Gorge? Big Leaf sleeping porch is the perfect OFF THE GRID retreat that offers a great combination of camping and modern amenities. Big Leaf sleeping porch is not your average cabin in the woods! Leave the complexities of modern life at home and enjoy the simplicity that Big Leaf has to offer. Big Leaf features fully screened walls for maximum nature-human connection. 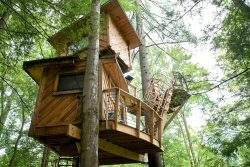 You’ll wake to the morning light tickling through the canopy just as soon as the sun shines! Breakfast? Say hello to your new outdoor kitchen - a small propane stove, compact dishwashing station and bar table for two. Sit back and relax on the porch - you’re in nature’s backyard now! But don’t worry, if “nature calls”, Big Leaf’s private composting outhouse is just a hop, skip and a jump away. And when night falls and you're tired of gazing at Mother Nature’s primetime television (fireflies and starry skies), pop inside and rest your head on a spacious full-size bed. There's no electricity here at Big Leaf, so be sure to take advantage of the lanterns provided and bring your headlamp. Big Leaf is conveniently located in the heart of Red River Gorge, a short walk from the Martins Fork trail head, and is close to popular rock climbing spots like Left Flank and Military Wall. Whether you are enjoying a hike, climbing, soaking in nearby swimming holes, engaging in kayaking or zip lining adventures or relaxing by the campfire you will be sure to find your much-needed rest and relaxation at Big Leaf! Kitchen: Outdoor camp kitchen features a coleman 2-burner stove and small handwashing and dishwashing station. Simple cookware, dishes and a french press coffee maker are provided. We will also supply you with 5-gallon jugs of water from our spring. Living/Dining: Bar table for 2 on the wrap-around porch and two patio chairs. Murphy bed inside can lift up for a covered living space on rainy days. Bathroom: Private composting outhouse at the cabin and access to our guest shower and bathroom at our headquarters just ¼ mile down the road. Bedroom: One full bed with pillows. There is space for tent camping for additional guests. Additional Amenities: 22” charcoal grill, battery operated lanterns, and private fire pit with seating. Firewood is also available upon request. For $20 we will deliver firewood to your fire pit. Please be sure to mark on your reservation if you would like firewood delivery. Please be sure to put out all fires COMPLETELY when you are finished and please do not harvest from our woods.